The American Banker Association’s September 2015 Credit Card Market Monitor found a 28% y/y rise in new subprime accounts, indicating that issuers are expanding their focus as they seek to grow revenues. 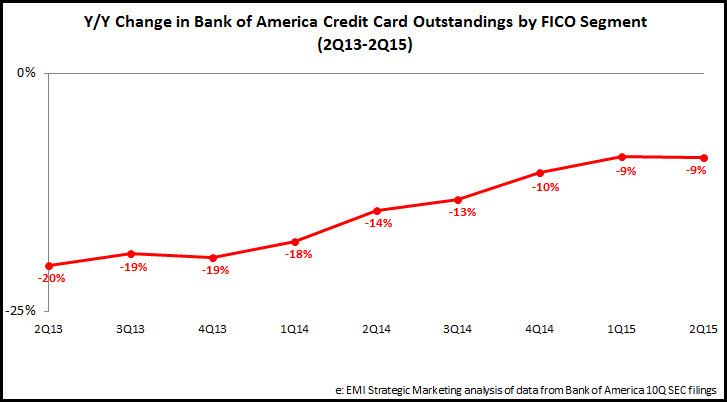 An analysis by EMI Strategic Marketing of the FICO composition of credit card outstandings at the end of 2Q15 finds that many leading card issuers are accelerating growth in sub-prime and low-prime outstandings. 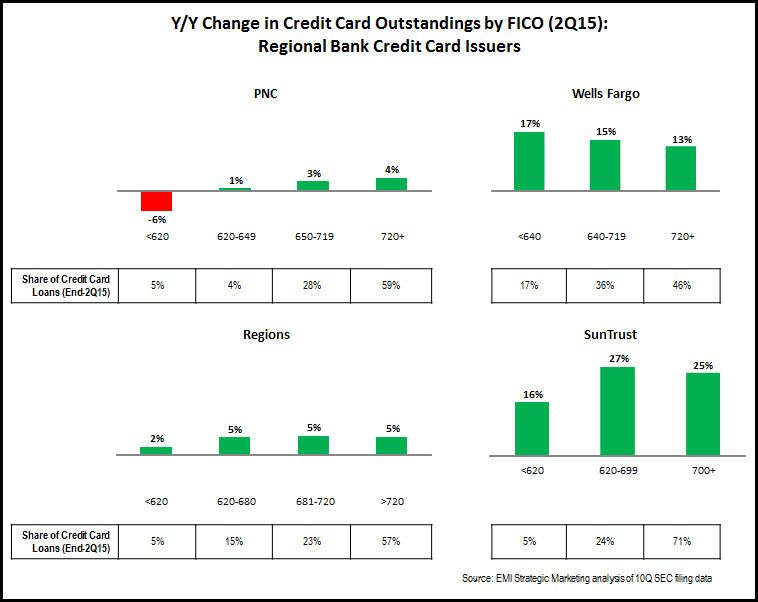 In recent years, Wells Fargo has reported strong y/y growth in all FICO categories. In its <600 FICO category, growth has accelerated to double-digit rates in the past three quarters. Its 600-639 FICO category has grown by double-digit rates in six of the past seven quarters. Among national credit card issuers, Bank of America’s subprime outstandings declined 9% y/y in 2Q15, but the rate of subprime loan decline has been steadily slowing in recent quarters. However, Citi’s subprime outstandings growth performance is less consistent, with y/y growth from 4Q13 to 2Q14 followed by declines for the past four quarters. There are also mixed trends when analyzing subprime outstandings performance of regional bank card issuers. PNC reported a 6% y/y decline in <620 FICO outstandings in 2Q15, compared to a rise of 1% in 1Q15. Regions reported strong growth in <620 FICO in recent quarters (double-digit y/y rises between 2Q14 and 1Q15), but this fell to just 2% in 2Q15. However, it should be noted that Regions’ total subprime outstandings were just $49 million, so variations in growth rates are not unexpected. SunTrust reported double-digit y/y increases in subprime outstandings for three of the past four quarters. The large national issuers continue to deal with legacy issues following the financial crisis. For issuers in general, underwriting standards continue to favor superprime consumers. And even though many issuers are ramping up subprime account production, it will take some time before it translates into strong growth in subprime outstandings. Meanwhile, an analysis of FDIC data for the 2Q15 shows strong outstandings growth for subprime credit card specialists, including Comenity (+23% y/y) and Merrick Bank (+16%). As the card industry in general increase its focus on the subprime market, it will be interesting to see if the acceleration in subprime outstandings growth among some regional bank card issuers is replicated by the large national issuers. In addition, growth in subprime credit card outstandings should result in delinquency and charge-off rates rising from their current historically low levels.